Here in New Zealand, parents of primary school children are asked to provide their child with a "large waterproof velcro closing book bag". These bags are used to protect school books from the evils of squished bananas, split yoghurt pots and whatever other perils lie at the bottom of a child's school bag. When Rascal started school, I made her book bag rather than buying one of the yawn inducing ones that I found in the shops. At the risk of sounding conceited, the bag pretty quickly gained a somewhat legendary status within the class. Teachers told other parents about how great Rascal's bag was and I was even approached by one of the teachers as to whether I could make a bag for her son when he starts school. Then last Friday, Rascal received an invitation to a birthday party. I put my thinking cap on to come up with a suitable present for a classmate. Rascal was keen to go shopping for a gift, but I could see this leading to us handing over some yucky pink plastic piece of rubbish. I'd prefer to give a present that we'd be happy to receive. It suddenly occurred to me that I had all the materials to make a book bag. I suggested the idea to Rascal (expecting it to be rejected immediately), and she liked it. She helped me to choose the fabrics and I got straight to work (pink binding was a must!). 1m Heat n Bond (You could use 1/2m vliesofix if you prefer, but I like the sturdiness that Heat n Bond adds to this project). Optional extras, small scrap of clear flexiglass plastic, short strip of binding approximately 1.5 inch wide. 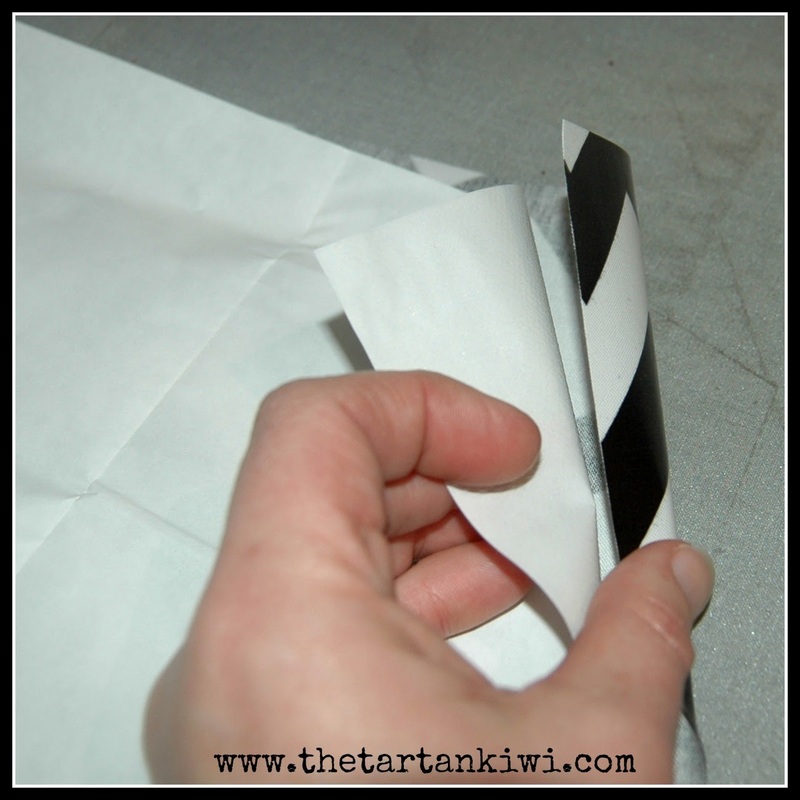 roughly cut your Heat and Bond to be slightly bigger than the pieces of laminated cotton. 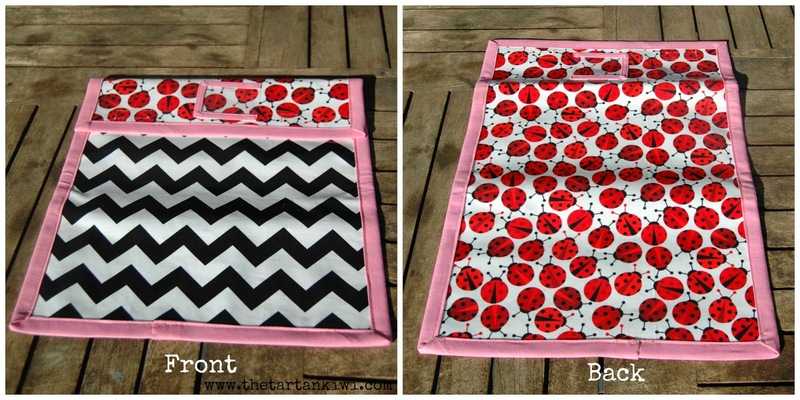 Place your laminated cotton shiny side DOWN on the ironing board. Cover with Heat n Bond- paper side UP. Tip: If you are worried about getting nasty sticky bits on your ironing board from the Heat n Bond, put a layer of greaseproof paper between the ironing board and the laminated cotton. Iron to attach the Heat n Bond to the laminated cotton. Peel the paper off the Heat n Bond. Place the shiny side of the laminated cotton is face down on the ironing board, lay the plain cotton fabric ontop of the laminate/ heat n bond. Remember- you should never iron directly on the shiny side of laminated cotton. Iron a second time to attach the lining fabric. Trim excess lining fabric and heat n bond from the edges. Attach a walking foot to your sewing machine. The best thing is to have either a teflon foot or a walking foot on your machine, but don't despair if you don't have either of these. 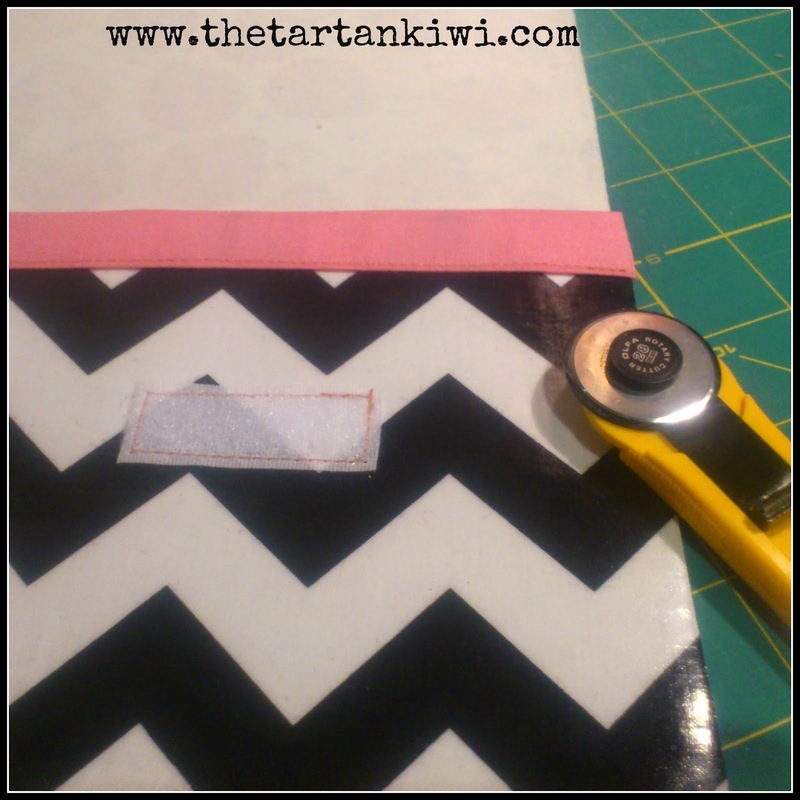 You can attach masking (scotch) tape to the bottom of your normal presser foot, and this will help your sewing machine to move smoothly over the laminated cotton. Try to sew as carefully as you can. Unpicked stitches will leave a line of holes. Not only is this ugly but it can ultimately weaken your fabric if you resew the same section several times. Don't make your stitch size too small as this will also weaken your fabric. 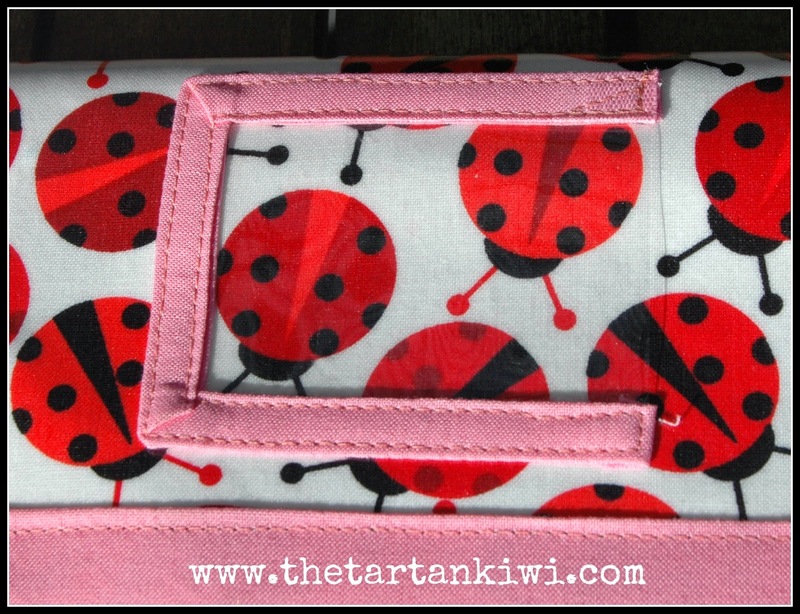 Be aware that pinning your fabric will lead to small permanent holes in your fabric. 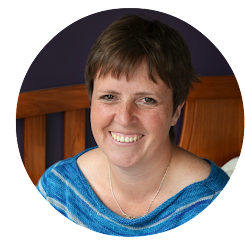 If you think you need to pin then consider using washi tape, clover clips or bulldog clips instead. Alternately, pin in spots that won't later be seen such as under the binding. Measure two spots about 2.5 inches from the top of the front piece of laminated cotton and sew the fuzzy parts of the velcro to the outer (shiny) side of the laminate. 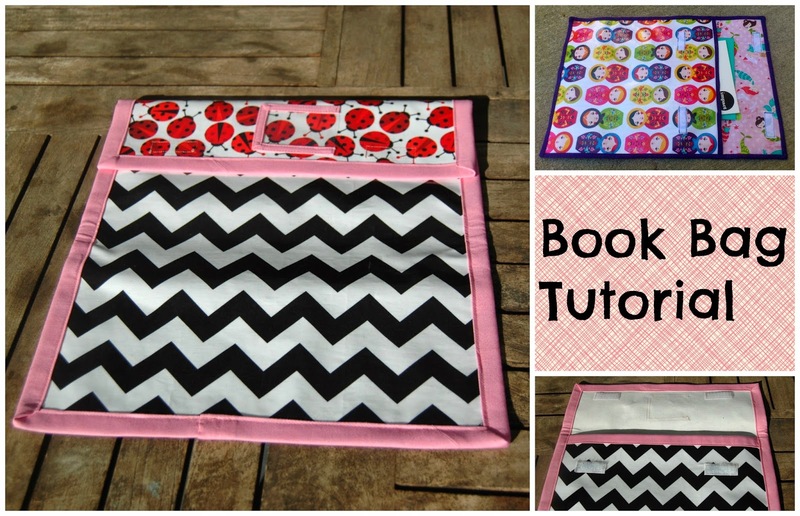 Now take your strip of binding and bind the top of the front piece. When I made the first book bag, I used a technique similar to this to attach the binding. 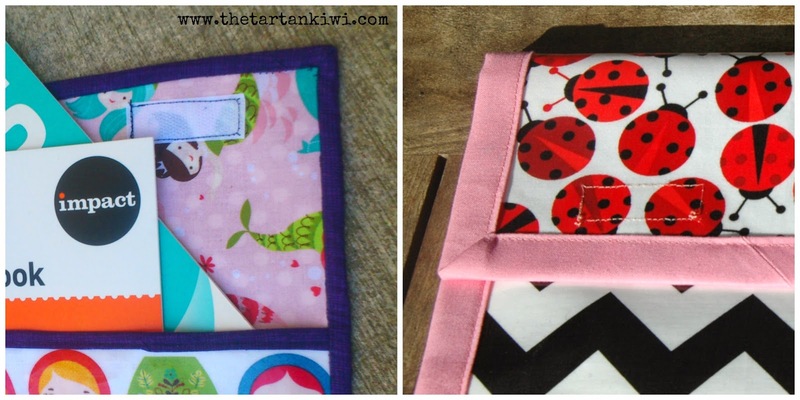 It was my first attempt at machine sewn binding. I was a bit worried about ironing the laminate too much, so skipped that stage. The finished result looked ok as long as you didn't study the stitching too closely. I didn't catch the back binding in several places. For this bag, I decided to try a different technique and I think that this technique led to neater results. I found it easier to get a good result. The only thing that I would say is that I used a 3 inch binding and in hindsight this was too wide. As such I have recommended that you all use a 2.5 inch binding or perhaps even narrower if you dare! The overall look of the two techniques is slightly different, so decide for yourself which method you prefer. Personally I prefer the look of the first technique but the neatness of the second technique. I will describe the technique that I used for the second bag so that you have the choice as to which technique you use. 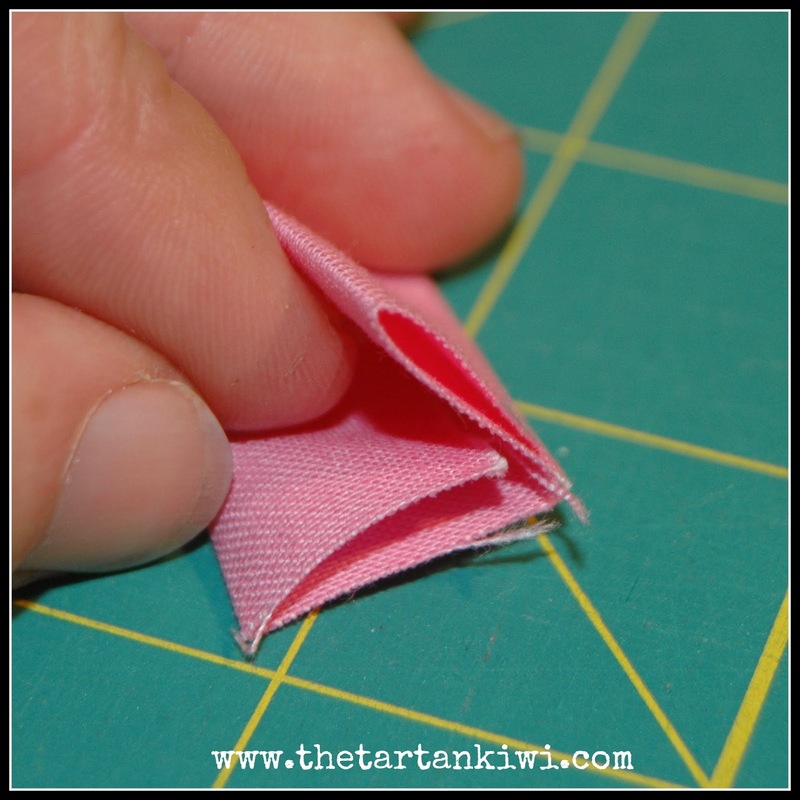 To create one long piece of binding, sew the short edges of the binding strips together and press the seam open. Now fold your strips in half along the length and press. Then fold each of the sides inwards and press again. Ensure that the top of the laminate fabric is right up against the centre fold of the binding. Sew a seam roughly 1/8 inch from the edge. Now place your two pieces of laminated cotton together with the shiny sides outwards. If you want, you can sew a 1/8 inch seam around the edges to keep the pieces together. Now apply the binding around the edge of the bag. To finish off, fold the lid of the bag down and check where you want the other parts of the velcro to be located. Sew them remainder of velcro on. I made a small pocket to house a nametag. It was made using the same binding technique. The binding was only 1.5 inch wide. I added the binding and attached the pocket in one step, taking it slowly, but if you are feeling less confident attach the binding to the bit of clear flexiglass plastic first then attach it to the bag. 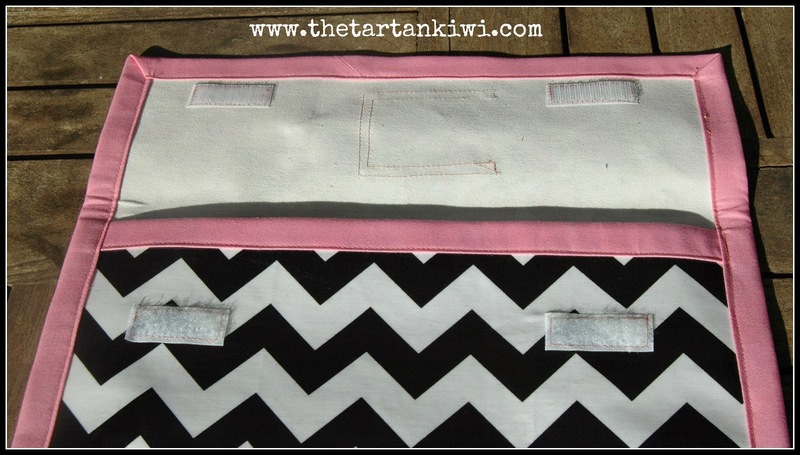 The pocket should be sewn to the bag with a line of stitching around three of the four sides, leaving a short side open. Admire your handiwork and give it to a school age child to enjoy! 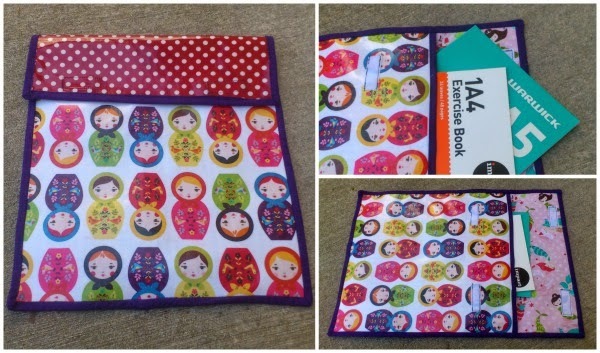 Do you remember the name of the Russian doll fabric. Awesome Juliet! Loved the first one you did, and love this one too! and a super handy tutorial to boot! It's easy to see why they are being coveted! This is EXACTLY the type of thing I want a sewing machine for! When I finally get one, this is going to be on my to do list for sure (my son might be old enough for school by then hehe). Thanks for sharing this great idea! Awesome! The ones my son has at his school don't last very long either - the bottom gets all wrinkled then begins to split. I hope you don't mind if I 'Pin' this for future reference? On this is fun! I'd imagine its be nice to take to the beach as well to keep things safe from sand and wet swimsuits. What a great idea. My children used to have a bag very similar for school, but it was made to hang on the back of your chair. This is so clever! And pretty. I am a tiny bit relieved that our school provides book bags LOL! Over here, our kids need a fabric Library bag and a hard plastic envelope book bag for their readers. Your book bag is SO, SO, SO much better than the ones the kids have to buy here. A fabulous idea for a birthday present. You may find Rascal is invited to LOTS of birthday parties by parents hoping to have one of your bags for their child.